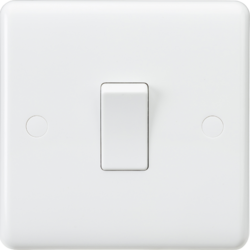 Contoured 7mm plate with rounded edges, includes screw cap covers.An intermediate switch is used when you have three switches controlling one light. Contoured 7mm plate with rounded edges, includes screw cap covers. An intermediate switch is used when you have three switches controlling one light. A typical example of this is on a landing. There is a switch at the bottom of the stairs, one at top of the stairs and one at the end of the landing. On this circuit you would need the middle switch to be intermediate (i.e. the one at the top of the stairs) in order for all the switches to function properly.